Having retired when running 1-2 in the French GP with identical transmission problems, the Team Lotus drivers were keen to sort out the problem and modifications were carried out in time for the British GP a fortnight later. Denny Hulme had collected 22 points in the first five races while Jim Clark had managed only 10 and he was lagging behind Jack Brabham (16), Pedro Rodriguez (12) and Chris Amon (11). The scoring system mean that the season was divided into two parts and drivers could count only the best five results from the first six races and the best four from the remaining five. The pressure was on Lotus to finish as the Lotus-Cosworth was clearly the fastest car. Clark and Graham Hill proved that again at Silverstone where they qualified first and second, Clark almost a second faster than the two Brabhams which completed the front row of the 4-3-4 grid, Jack Brabham having lapped slightly faster than Hulme. It was not all plain sailing however as Hill had suffered a suspension failure and severely damaged his car at the end of practice. The second row featured Dan Gurney's Eagle-Weslake, Amon's Ferrari and John Surtees's Honda. The third row consisted of Jochen Rindt and Pedro Rodriguez in their Cooper-Maseratis, Bruce McLaren in the second Eagle and Mike Spence in the fastest of the BRMs, the regulars being joined by a private entry for F1 new boy David Hobbs. The grid also featured Formula 2 star Alan Rees in a third Cooper-Maserati. A new Lotus was built up overnight and at the start Clark took the lead from Hill although Brabham overtook Hill for second on the second lap. Clark had no intention of fighting with Brabham, however, and began to build a lead while Hulme worked his way up after a poor start to be fourth by lap nine. 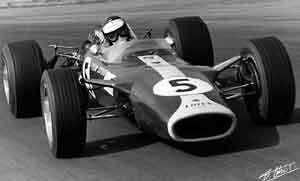 He then picked off Brabham, who had been overtaken again by Hill, and went after the two Lotuses. On lap 26 Hill, by then used to his new car, took the lead from Clark but that lasted only until lap 55 when Hill slowed with a rear suspension problem. He pitted for repairs and was sent off again but retired 10 laps later with engine failure. On this occasion, however, Team Lotus's preparation skills were not in doubt and Clark duly won the race by 13 seconds. Hulme was second and Amon third, the Ferrari driver having passed Brabham in the closing laps.